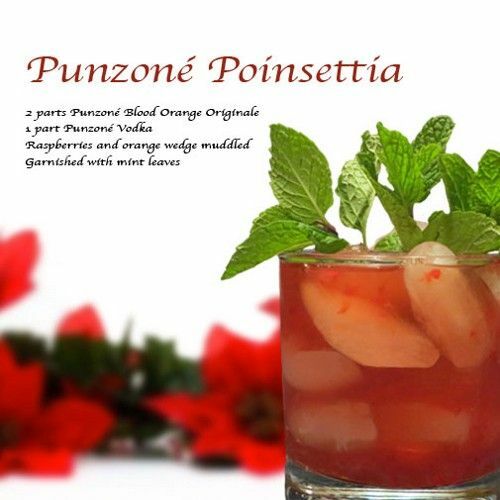 The Punzone Poinsettia features the flavors of blood orange and raspberry. This is a crisp and refreshing drink, perfect for those who like just a touch of sweetness in a cocktail. The muddled fruits can be strained, but unless you used seeded fruit it’s really not necessary. This is a great choice for entertaining because it’s so agreeable to so many palates. Muddle a small handful of raspberries with an orange wedge. Fill a cocktail shaker with ice and add the fruit muddle and the liquors, and shake well. Pour into an old-fashioned glass and garnish with mint leaves.